There’s a lot of discussion in the media at the moment about equality, so we thought we’d take this opportunity to talk about equality in the dojo, a safe environment where we can practise for the real world. The concept of the dōjō draws elements from both Shintō and Buddhism. The dojo is a sacred space, a place of calm and respect. When we enter the dojo, we symbolically purify ourselves as we remove our street clothes and don our ‘spiritual armour’, our dōgi (uniform). We leave behind our outside lives — our profession, status, gender, race and creed — to encounter our selves, striving to resolve physical conflict through the practise of aiki (harmony). What appears to be an external problem — someone physically restraining us — actually has an internal solution. Over time we learn to respond with calm, confident competence instead of reacting with fight, flight or fright. This requires us first to resolve our internal conflicts: our doubts, fears and preconceptions. When we arrive we greet sensei, our teacher. She or he is our principal guide on the journey, someone who has been practising the way for some time. When we line up at the start and end of class our sempai sit to our right. Sempai means ‘senior’, not necessarily in age but in terms of time-in on the mat. They help us through the nitty-gritty and we express our gratitude with respect and cooperation. On our left sit our kōhai, our juniors, the people for whom we are responsible. In this way we automatically have an established relationship with every other person in the dojo. This helps to build community and promotes safe and harmonious learning. At the beginning of class we all bow, saying ‘onegai shimasu’ (please). At the end of class we bow again and say ‘arigatō gozaimashita’ (thanks for that!) to express our gratitude. We exchange this respectful ‘please’ and ‘thank you’ each time we pair up to train during class. This is typical in dojos worldwide. In our dojo, after bowing to end the class, we form a circle to signify that while we all have different roles and responsibilities, we are all working together and taking care of each other. ‘Otagai ni rei’ means ‘bow to each other’. 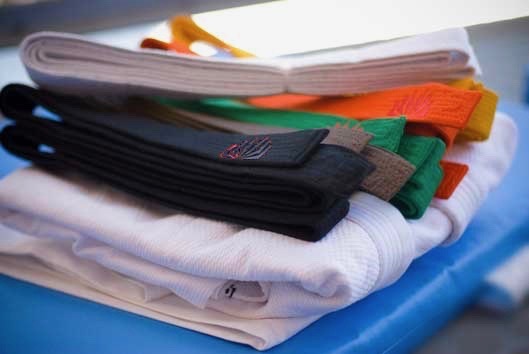 Coloured belts are comparatively new to Japanese martial arts, having been introduced as recently as 1935. They help identify relative skill levels in larger dojos and are used more to combine than to divide, because in the dojo we are all family for the few hours a week we spend together. Just as in a family we have different roles and responsibilities as parents, children and siblings, so too in the dojo we have roles as sensei, sempai and kohai. Over time we hope to experience all of these roles and at times we might occupy all of them simultaneously! Equality is not about everyone having to be the same, equality is about everyone receiving the same respect whatever their position, abilities or attributes and regardless of similarities or differences. If we can spread these feelings of community and equality into the wider world, wouldn’t that be something? ← Aikido for children: how young is too young? Great, Easy to read article. can I suggest that a link to the glossary is also in the top bar, or a side bar that is always on screen. to me having the words say click glossary, and not being able to see the link for glossary as I have scrolled down the page, is not really intuitive and may cause some confusion.